The ongoing advantages built into all Israel Shipyard products, which are created and maintained by the Israeli defense industry, are further enhanced by ISL integrated training and support. This critical combat edge is being shared with other naval forces and homeland security forces across Africa, Europe, Latin America and Asia. 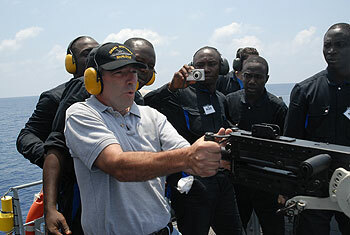 Methodical and detailed training of vessel crews by retired Israeli Navy officers. Maintenance team training, either at Israel Shipyards or at the suppliers of the engines and equipment. ISL team support on-site for long periods as desired. Personal, hands-on guidance until full confidence is achieved. A permanent Israel Shipyards service center at the customer's site, if desired. Specialized research to create tailored technological solutions for special customer needs. A full set of documentation and operation manuals is provided for each vessel, as part of the delivery.